Hey guys! So January is always a bit of a planning month for us to slow down and set goals for the year. We've got a lot of exciting projects happening! First off we'll soon be offering natural wood blank skateboard decks WITHOUT varnish for all you artists out there who have been asking us for them! As with all our blank decks, they'll be $34.99 each, with free shipping on 3 or more, 15% off 6 or more, and 20% off 12 or more. We should have them pressed by the end of February/early March. ALSO we're working on launching a brand of eco-minded, sustainable clothing and skateboard decks called 416CHAMPION (416champion.com). For each deck sold, we'll plant a tree using a portion of the proceeds through Tree Canada / Arbres Canada! The first run is going to have a metallic gold foil finish... we're talking seriously steezy looking decks! We want to sponsor more local skate comps this year so if you have any ideas and want to work with us to help make them happen or are looking for sponsors for your event... hit us up! Big news – Ace of Dymondz now has an address that is open to the public! That’s right everyone, you can now make appointments to visit the Ace of Dymondz warehouse at 222 Islington Avenue and check out our products in person. One of the best things about our new location is that right after you come by to pick up your brand new deck, you can head across the street and try it out at 8th Street Skate Park. This curvy 930 square foot course snakes through the park and is a perfect place for pros and novices alike to shred the gnar. The studio is located on the second floor of a sprawling factory that has been repurposed to house a variety of interesting businesses and artists. On our first walk around the building, we saw two film studios, a mysterious neon green door, a martial arts studio, a crossfit studio, met a map maker and our new neighbour; Jeff at Urban Dog Products gave us a naturally shed piece of elk antler for our little woof; Otis. We spent most of the day lugging boards, wheels and furniture through the factory and up a very creepy old school freight elevator to the studio. After a couple of hours we got almost everything set up, with some great looking displays of some of our favorite designs. We still have some more product to bring over, and will be setting up some wall displays over the next couple of days, but our doors are open. If you’d like to check out the studio and meet us, shoot us an email through the website to book an appointment. We are excited to help you build your perfect board! We've got new Paradise Plastic 24" LED cruiser boards now in stock for $99.99 at aceofdymondz.com! NEW SKATEBOARD WHEELS IN STOCK NOW! I just uploaded some new skateboard wheels from Girl Skateboards and Spitfire. All are on sale for just $29.99! 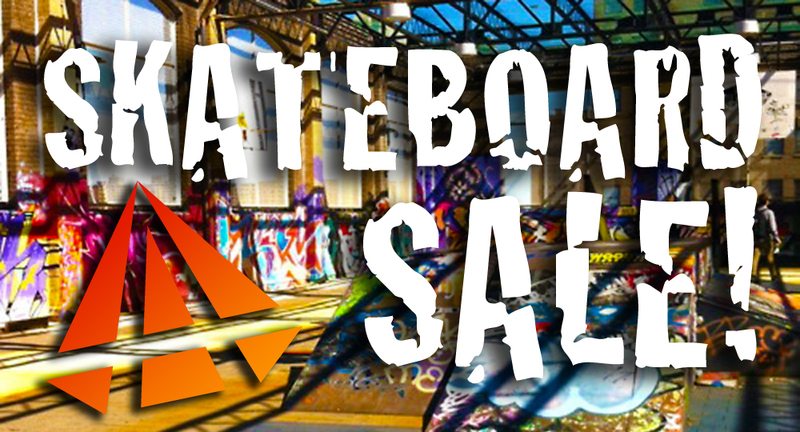 Up to 45% off skateboard decks + free skateboard DVD with griptape purchase! They're selling out fast so get your deck before it's too late! This is personally my favourite longboard in the shop. I've had one for over two years now. The double drop gives you the ability to ride it extremely low to the ground making it super stable for new riders or anyone wanting to shred some gnar at high speeds. We also carry the 36" version for smaller riders or anyone looking for a great commuter board! It's currently on sale for $129.99 from $156.99! Grab one while we've still got it in stock! Some time in early May me and Big Tone were sitting around, probably too safe for our own good, discussing past and future longboard events. Reminiscing over past events like Devils Night Shred, The Icetastic Event, and The Riser Race got us thinking. What could we do that’s fun and unique? Something that would bring the whole community, from the groms moms, to the pro riders out. Something even the crowd could participate in. This is how the Wet and Wacky Wace was born. Not long before 1pm on July 7th the water balloons were finally done thanks to the help of a few local path rats. Over 300 rounds of ammunition and a whole lot of water guns, the race was set to begin. The grom races were wet and fierce. No one wanted to give anyone an inch of room including the vicious crowed. No matter how much the crowd pelted and sprayed, the brave groms bombed and slashed their way through the course. Once a final heat was decided the buttboard races began. One might think it would be safer or somehow more pleasant to race sitting down rather than on your feet. However at The Wet and Wacky Wace the opposite is true. When sitting down you leave much more area to target with a water balloon. Riders were getting pelted all over and some people had even taken to targeting their wheels to ensure they would not make the corner. Never had I seen people drift corners on their butts like this before. Open category was some of the most intense racing I had ever witnessed. People were getting relentlessly pelted with water balloons throughout their heats. There were bails all over and frankly I was starting to worry about some of the riders safety. However these brave souls wanted nothing to do with quitting and pushed on. At this point the first high speed left was absolutely soaked as some people had taken to pouring gallons of water all over the course. With little to no traction the riders tried to navigate the corner with little to no avail. The finals were set to be 3 Chinese downhill races, one for each category, all with the top three riders competing. The course is only about 8-10 feet wide at it’s widest point so this was going to be one hell of a show. For each of the finals a super secret stash of surplus water balloons were unleashed. The riders would face about 10 water guns and 20 balloons coming at them all at once. When the mist cleared we had our winners. And they were all in one piece! Thank you so much to all the riders and participants as well as the people close to me that support my habit. Special thanks to Big Tone and The Skate Invaders! Thank you to all the sponsors: Switchback, Rayne, AmWood, Longboardism, Hogtown, Landyachtz, Randal Trucks, H.I.T.S, Longboard Living, Bombora, Pinebox, Champstiles, Ace of Dymondz, Goon Gloves, Sabre Trucks, Concrete Wave, Loaded, and Boz Boards. Don’t forget to tell your mom!